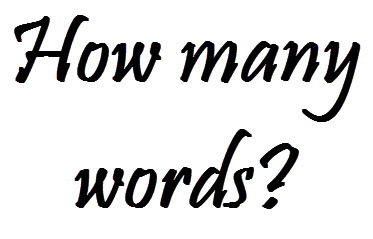 A frequently asked question is how many words are there in a short story, novel, thesis paper, etc. It is easy to get a quick word count for your own story or paper, but writers and students also understandably want to know how long a certain type of writing is. There is not always a standard length but there are length parameters that different types of writing fit in. Below we have listed some standard word counts for different types of writing. We have also given explanations for these lengths below. Tweets - The original Twitter length was 140 characters but Twitter upped it to 280 characters earlier this year. 280 characters is about 55 words if you use 5.1 words as the average word length. The 5.1 figure comes from a research paper that analyzed word lengths using Google Books. Poetry Length - There are many different types of poems so length varies greatly from short haikus to epic poems, which can be book length. The shortest poem, "Lines on the Antiquity of Microbes," consists of just three words. Picture Book Length - 32 pages is a standard picture book length in the industry as Darcy Pattison explains, but it can vary. The number of words will vary depending on the age of the reader the book is intended for. Chapter Length: Chapter length varies greatly even within individual books. Some authors have short 2-5 page chapters while other authors may have novels with chapters that are over 10,000 words. Short Story Length - With writing contests you will find word lengths that vary from up to 1,500 words for short shorts to up to 10,000 for short stories. Stories in the New Yorker range from 2,000 to 10,000 words according to the current fiction editor Deborah Treisman. Dissertation Length: A study of dissertations at the University of Minnesota library system found they vary from 100 to 200 pages in length. Novelette and Novella Length: The SFWA has a novelette ranging from 7,500 to 17,500 words and a novella ranging from 17,500 to 40,000 words in the rules for its Nebula Awards. Novel Length: The Guide to Literary Agents puts 80,000 to 89,999 in the "totally cool" range for commercial fiction in this article. Some genres run shorter or longer than others. Bible Length - Word Counter reports that the King James Bible is 783,137 words long. Longest Novel: The longest novel is The Blah Story. The ridiculously long novel contains 3,277,227 words. You can find a list of more very long novels on Mental Floss.